To be able to scan Alpha Numeric barcodes, the version of System Five you are running MUST be version 6.1.2.254 or higher. If you are using an older version of System Five you will only be able to scan numeric barcodes. You must install the PAL Application on your PC before using the Datalogic memor handheld device. It is the program that interfaces the device with your Windows Operating System, and manages how and where files are transferred back and forth between Windows and the device. Click the link to download pal_ver._1.10.2.0_pal-communicator_ver._1.2.10322.zip and save to your desktop. Just accept the defaults by clicking Next. Installation is complete. Click Next. Choose whether you want the batch files to open in Excel or Notepad. 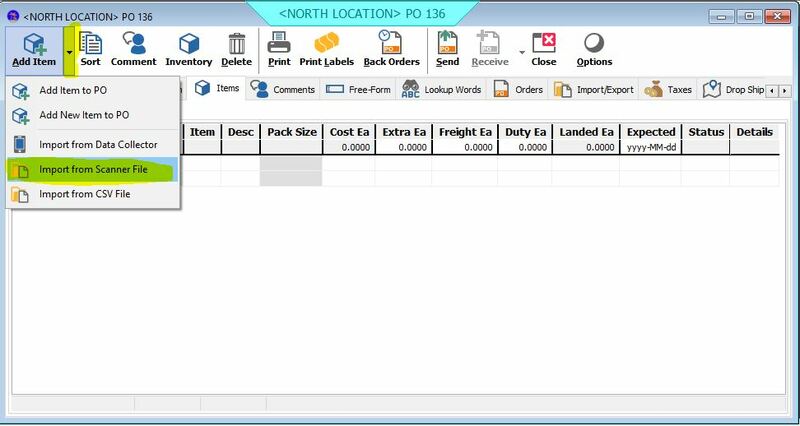 We recommend Notepad because Excel will force some changes to the file that we do not want, such as dropping leading zeros from barcode numbers. Notepad will not do this. On this screen you can also set the default directory that the batch file will be downloaded into. To change the path click on the settings tab. Also in the settings tab you can choose to append new counts to the existing file on your PC or Overwrite it., which you would not normally want, unless you will be leaving the count on the device and keep coming back to it to add more items. What this means that even after synchronizing your counts, those counts would remain on the PC and the next time you synchronize parts from the device, the new parts will be added to the previous list. We recommend setting this option to Replace rather than append, it would be a good Idea to also check the check box next to Copy Files To Backup so that there is a backup of your count prior it being modified or deleted. 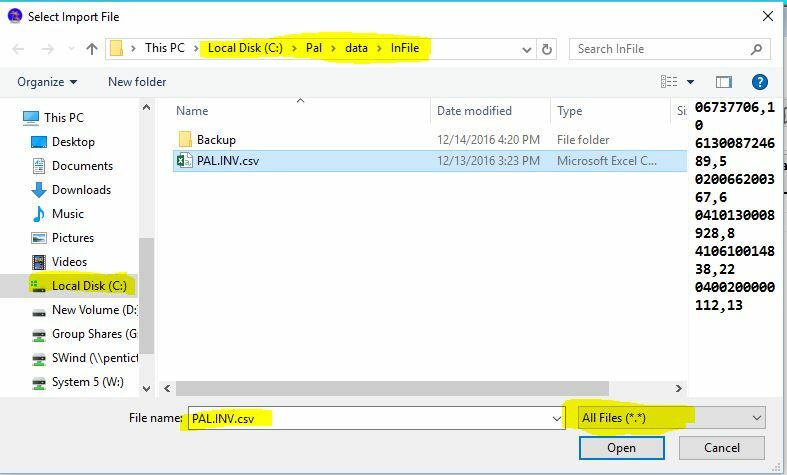 Click on OK to save, and the PAL application will minimize to your Windows Tray. Pal Communicator must be running on the PC for it to import the count batch from the data collector. In fields tab, uncheck fields 1 and 4. This configuration will place quotes around the barcode whether it is Alpha Numeric or Numeric. In version 6.1.2.254 and higher, System Five is able to strip out the quotes when importing. Select field 2, and make sure that Loop and Required are checked, and that Type is set to Text. Select field 3, Loop should not be checked, but Required should be checked. make sure Type is set to Number and set default to 1. Select another tab and then come back to make sure the settings are remembered. Exit Pal Settings by clicking on the X button on the top right of the screen. Exit the Pal Applications menu by clicking on the X button on the top right of the screen, and click Yes to exit. 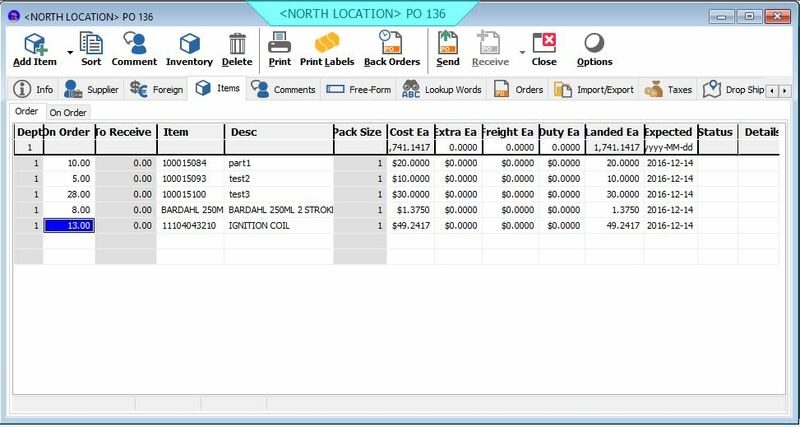 You should now be able to start scanning barcodes and entering quantities. Older versions of System Five will only be able to scan Numeric Barcodes and MUST follow this process. This process will store the barcodes in the Memor device without quotes. You will then be prompted to enter an inventory item number, or you can click the orange scan button on the memor's keyboard to scan a barcode. Next you are prompted to enter a quantity. You can enter this on the memor keyboard. If you are pressing a number on the keyboard, and getting letters instead, you must press the Alpha key on the device to change it to a numeric keyboard. Once you enter a quantity, press the ENT key on the memor keyboard to accept the quantity. This will bring you back to the Item screen and it is ready for you to scan your next barcode. 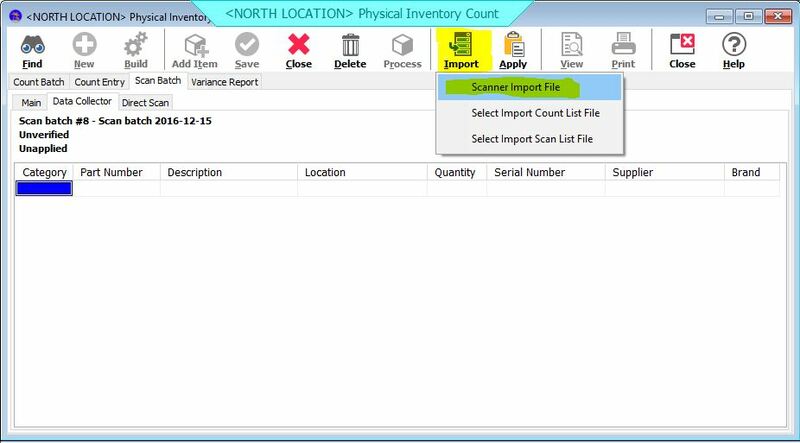 The collector will export a file with the barcode number, a comma, and the quantity. Windows Mobile Device Center will pop up. Close the Windows Mobile Device Center. It is not needed for the data collection process. 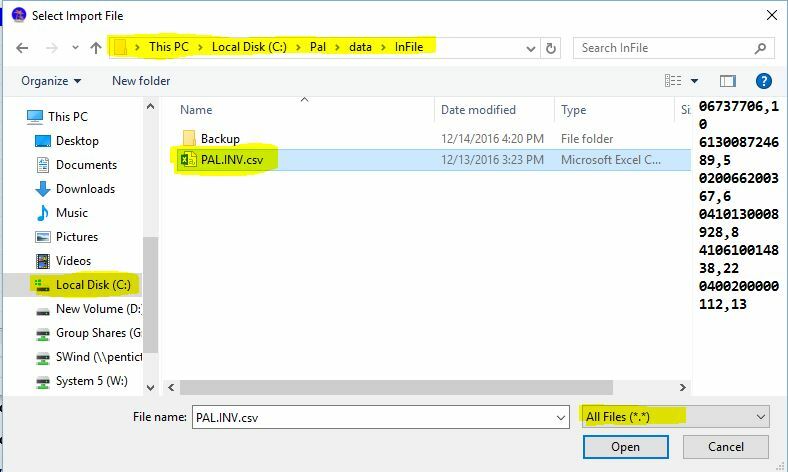 PAL Communicator should have started transferring the count batch file to your PC, and saved it to the folder you previously set up. Once it transfers the file it will open in notepad. If the file did not transfer, you can click the transfer button to manually transfer it. The problem here is that the backup folder will only contain one file. If a new file is transferred from the Datalogic memor, the backed up file will be overwritten by the new backup. If you need to store multiple copies of the collected files, you need to rename the file before transferring a new file. The data collector files are not automatically imported into System Five. 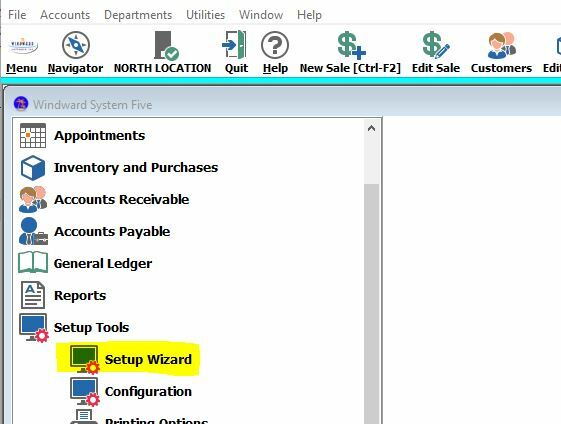 However, you still need to go into the Setup Wizard in System Five and make the following changes. From the Navigator window, click on Setup Tools and Setup Wizard. The only setting you need here is to set the Data Collector File Format to Item,quan. All other parameters should be left blank, as they have no bearing on importing the data collector files. 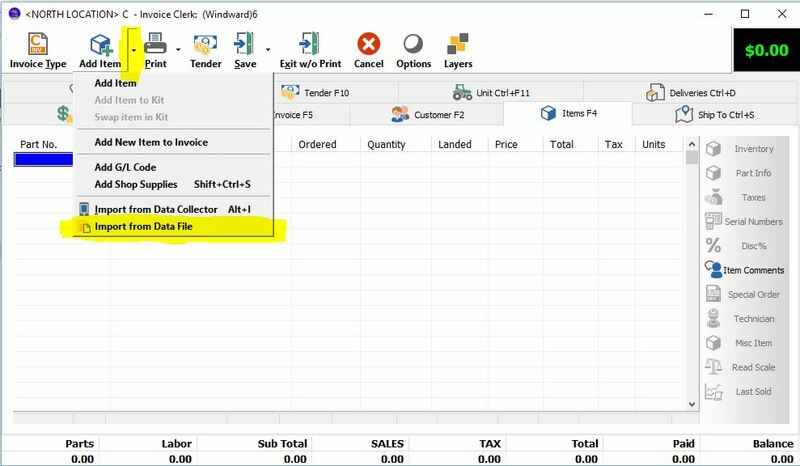 To import a Data Collector File into an invoice, you must first be in a New Sale screen. If you are in the Touch Screen or Quick Sale screen you will need to press F4 on your keyboard to see the New Sale Screen. From this screen you can import a Data Collector File by Clicking on the little down arrow next to the Add Item button, and then click on Import from Data File. Browse to the following Folder : Pal, Data, InFile, and then click on your Data collector file. 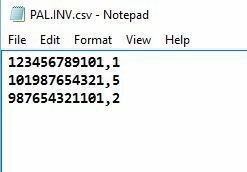 In this example we named it PAL.INV.csv. 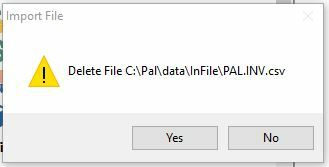 I would recommend clicking on the No button and manually deleting the file later. And as you can see the invoice has been populated with the items based on the barcode and quantity. This process is very much like the process of Importing File into an Invoice. 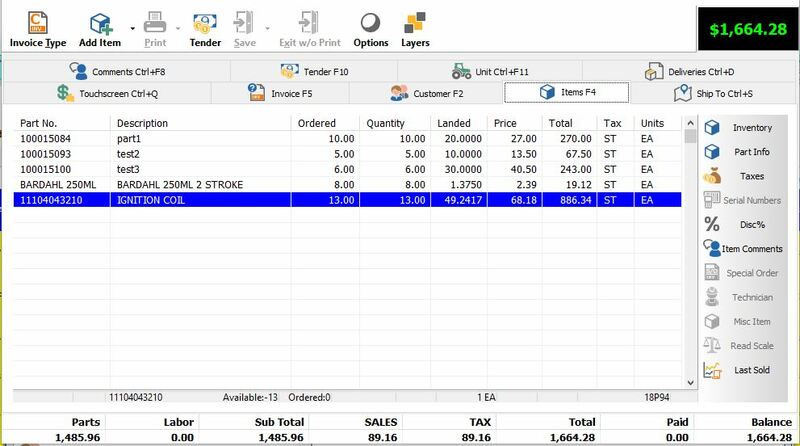 From within a Purchase Order, select the Order Tab. Click on the little down arrow next to the Add Item button, and then click on Import from Scanner File. And as you can see the Purchase Order has been populated with the items based on the barcode and quantity. 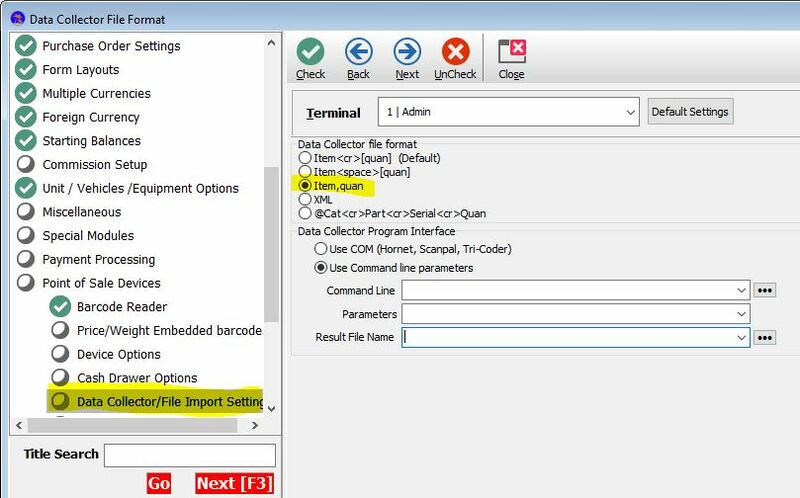 This section will only be covering steps specific to importing a Data Collector file from the Memor device. 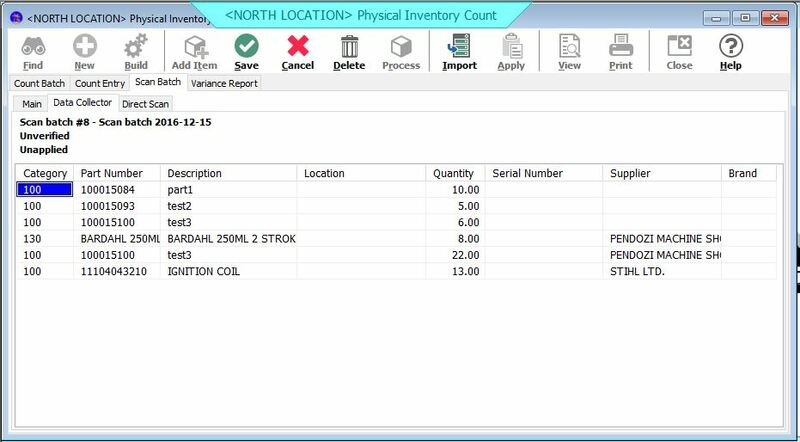 For a video of how to use other data collectors with the Physical Inventory Count, please refer to the following link. 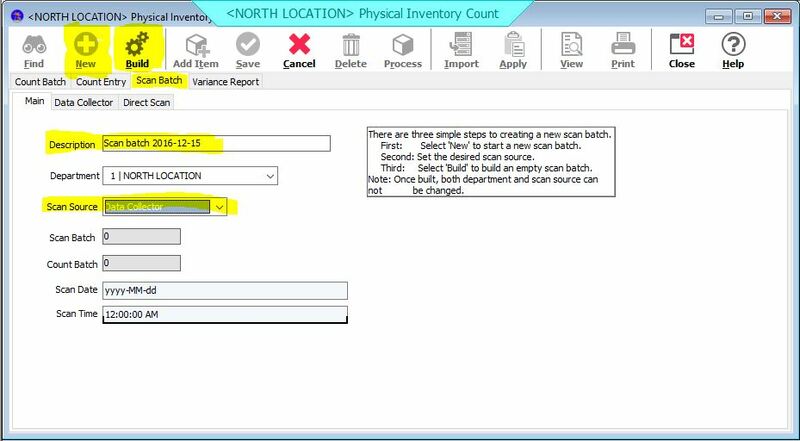 Open the Physical Inventory count and click on the Scan Batch tab. The batch will automatically be given a description, but it is a good Idea to give the Scan Batch a meaningful description for later, but that is optional. This will take us to the Data Collector tab in the Scan Batch. Select Scanner Import File from the list. As you can see the Scan Batch has been populated with the items based on the barcode and quantity.